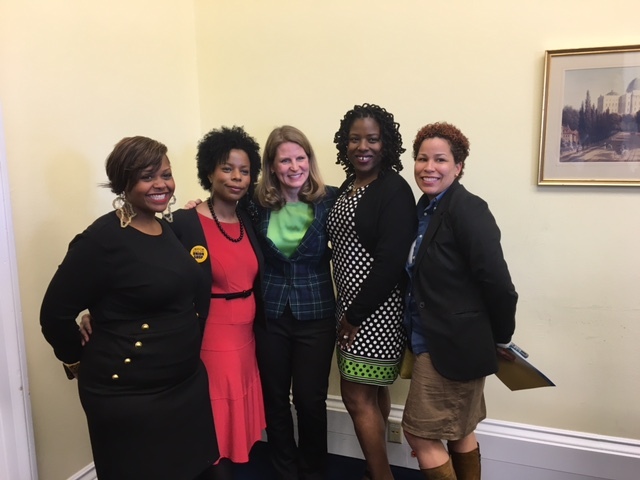 Kim Mitchell (pictured in red) along with AFL-CIO Secretary Liz Shuler (center) and other attendees of the even on the Hill. On March 17, the AFL-CIO launched the results of a survey of nearly 25,000 women, including union and non-union members across the country. Over 800 UFCW women retail members participated in the survey. The launch of the survey and the hashtag “#EqualPayEqualSay” arose from working women overwhelmingly calling for equal pay for equal work, more control over their schedules on the job, better quality of life – and the resounding conclusion that their union was the most powerful tool to reach a better life for working women and their families. AFL-CIO Secretary-Treasurer Liz Shuler, joined by Congresswoman Rosa DeLauro (D-Conn.) among other elected officials at the press briefing, heard from UFCW Local 400 member and Macy’s worker Kim Mitchell, who spoke about how her union contract won her three weeks’ notice on her work schedule, vacation days, paid sick leave and a pension. Kim called for rights and respect on the job for women who hold full-time jobs, numerous jobs, and care-taking responsibilities that are often overwhelming and exhausting. The survey revealed overall that 62 percent of working women are the primary breadwinners in their family. And 30 percent spend 30 or more hours a week on caregiving responsibilities. With a very demanding schedule between work and home, over half have four hours or less a week of personal time – only 35 minutes per day. Retail women in particular identified their top issues as not getting enough hours, unpredictable work schedules and lack of control over their work schedules, with 59 percent of them saying they face unpredictable hours. 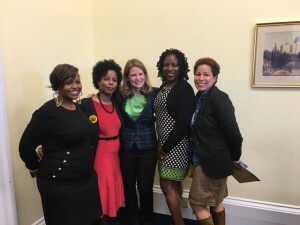 When women were asked to pick the social or economic issues they would personally take action on to change, the overwhelming top answer (46 percent) was “equal pay for equal work.” In this important election year, it is particularly important to understand these top priorities because 75 percent of these working women are planning to vote in the November 2016 election.